Enter your starting address to get directions to our office. 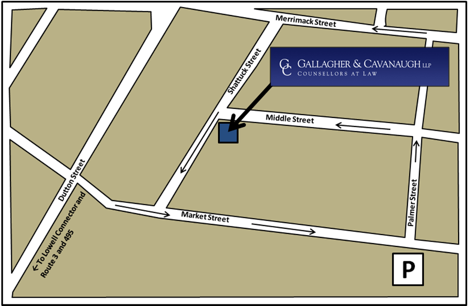 Located in The Gaslight Building in historic downtown Lowell, Gallagher & Cavanaugh is approximately 30 miles from both Logan International Airport in Boston and Manchester Regional Airport in New Hampshire, and just minutes from Route 3, Route 495, and the Lowell Connector. From Rte 495 or Rte 3 take the Lowell Connector to Thorndike Street (Exit 5B). Continue on Thorndike Street, which becomes Dutton Street. Take a right onto Market Street. Take the first left at the traffic light at Palmer Street and then the first left onto Middle Street. Gallagher & Cavanaugh is on the left at the end of Middle Street at The Gaslight Building, 22 Shattuck Street. Parking is available in the Leo Roy municipal garage on Market Street at the intersection with Palmer Street just one block from The Gaslight Building. On-street, metered parking is also available in the neighborhood.